The 6 Components of the Perfect Baseball Pitching Delivery - It is important that every pitcher has an understanding of how a sound delivery looks and feels and also has the ability to teach it. It is the most important aspect of getting the most out of your ability. A sound and proper delivery will improve the pitchers ability to control or locate pitches. 7 Keys to Building Good Work Habits in Young Baseball Players This baseball coaching article discusses the value of work and how to motivate players to work harder. Working and learning to work are one of the vital elements required in the building of a successful baseball team and program. In baseball coaching work and baseball playing involves a lot of things. Great Coaches are great coaches for a reason. They love the game. They love the kids. They love to instruct and teach. They love to mentor and minister to youngsters hoping that something they do will help that kid become a better person. Defensive Drills For Coaching Youth Baseball Middle Infielders The article outline 4 Baseball Middle Infielder Defensive drills for coaching youth baseball middle infielders. The drills are used to improve fielding skill, teach ground ball fundamentals, build player confidence, and quicker hands. There are some basic points that you must know before buying a batting cage. When you buy a batting cage you are making an investment that should provide you with years and years of top quality batting practice. Here I discuss what I believe are the 12 most important things to consider when you purchase your home, team, school or backyard batting cage. Baseball Coaching - 10 Tips For Improving the Quality of Your Baseball Practice Time In this article Coach Dixon discusses the value of Time and how it relates to coaching baseball. He discusses Baseball Coaching Time in two contexts; Time is seconds, minutes and hours and Time is also knowing that there is a time and place for everything. Baseball coaches must know the value of time spent doing team activities. Baseball coaches must know that doing the wrong thing at the wrong time will cause team and parent problems that can be a "pain" to deal with. Baseball Coaching and the Importance of Goals For Team and Player Motivation There are very few volunteer jobs more challenging, time-consuming or rewarding than being a coach in your local league. There are many four letter words used by coaches that I can not use here. Here I want to discuss the 4 four-letter words that can and will determine the amount of success a coach has during the coming season. The four words are Goal, Plan, Work and Time. Two Batting Cage Myths that are simply not true are (1) A Batting Cage must be long for it to be usable for all ages and (2) A batter must see 75 mph pitches to receive maximum benefit from cage work. Coach Dixon discusses how many batting cage buyers are mistaken or misled in buying or building a new baseball batting cage. Baseball Parent - Make Your Kid a Major League MVP I know that the title got your attention. Everyone knows and respects the Major League Baseball players like Derek Jeter, Albert Pujols, Alex Rodriguez and Manny Ramirez. Many parents dream of having their little league player growing up to play college baseball player and Major League Allstar. Do you know and realize how small the actual percentage is of little league baseball parents that ever see that dream come true? Just helping your kid become a solid little league player that loves and enjoys the game of baseball should be the goal of every baseball parent. "Shove-Up Baseball" - A Great Baseball and Softball Practice Game Adding variety and preventing boredom is an attribute of great coaching. Little league and youth baseball practice can be both fun and productive at the same time. Great coaches know the importance of having a pure fun day every one and a while. The game "Shove-Up" is definitely not an activity that you would use every day, but as a "change of pace" activity, it serves well to motivate kids and teach competitiveness. How is "Shove-up" played? Baseball Pitching Know-How - The 30 Cardinal Sins of a Baseball Pitcher Every baseball team's fortune lies in the hands or the "arm" of the pitcher on the mound. This can be said for pitching at every level from Little League Baseball to High School Baseball to College Baseball and to Major League Baseball. As I was watching the College World Series on ESPN last June, I noticed that every pitcher did the little things perfect. Every pitcher had basically the same approach to the game. Every college baseball pitcher in Omaha tried to get ahead of the batters, pound the strike zone with good pitches, and let their defense make plays behind them. Baseball Hitting - The 3 Basic Elements of the Major League Baseball Swing The "Major League" baseball swing is a thing of beauty. If you watch it in slow motion, you will see that there are 3 common elements of the swing that that most major league baseball players have in common. Baseball batting practice repetition makes the Major League Baseball Swing consistent with the same 3 basic elements exhibited with every swing of the bat. A Dozen Things That I Feel Every Youth Baseball and Youth Softball Batter Should Remember When the coach gives the runner or runners a steal sign get deeper in the batter box. This extends distance for the pitch coming in and the throw by the catcher. This slight movement may give the runner a little more time. Click Here for More Great Baseball Articles by Coach Nick Dixon. Nick Dixon is the President and founder of Nedco Sports, the "Hit2win Company". Dixon is also an active and full time high school baseball coach with over 25 years experience. Dixon is widely recognized as an expert in the area of baseball training, practice and skill development. Coach Dixon is better known as the inventor of several of baseball and softball's most popular training products such as the Original BatAction Hitting Machine, SKLZ Derek Jeter Hurricane Hitting Machine, Original Hitting Stick, Hit2win Trainer, SKLZ Target Trainer, SKLZ Derek Jeter ZipnHit Pro, and Strikeback Trainer. Dixon is also a contributing writer for BaseballCoachingDigest.com, the Baseball 2Day Coaches Journal (bb2day.com), BattingCageBuilder.com, AmericanBaseballDirectory.com and the Hit2win Baseball Coaches Monthly Newsletter. 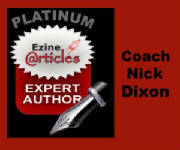 Dixon has 5 blogs related to baseball training including the BaseballCoachingDigest Blog, CoachesBest Training Equipment Blog, Hurricane Machine Training Blog, Baseball Batting Cage Blog, and the Bat Action Training Blog.